Created and hosted by World Sleep Society, World Sleep Day is an internationally recognized awareness event bringing researchers, health professionals and patients together to recognize sleep and its important impact on our health. 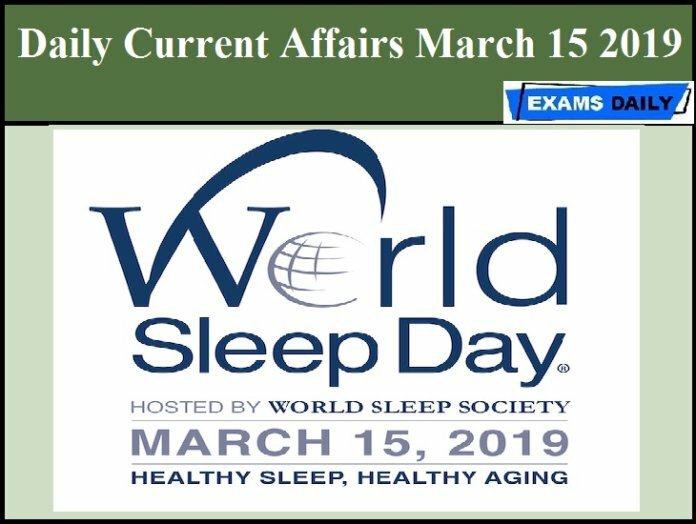 World Sleep Day 2019 will incorporate the slogan, ‘Healthy Sleep, Healthy Aging,’ intended to emphasize the importance of sleep in overall health at any age. The International Organization for Standardization (ISO) has certified the ‘Vishnu Nivasam’, the Tirumala Tirupati Devasthanams’ (TTD) rest house and pilgrim accommodation complex here. This institution is the first TTD-run facility to be given the certificate. The Supreme Court revoked the life ban on former Indian cricketer S. Sreesanth in a case of spot-fixing and asked the Board of Control for Cricket in India (BCCI) to re-examine its quantum of punishment. Australia will embark on its largest ever defence engagement with Sri Lanka next week as part of the Indo-Pacific Endeavour 2019. More than 1,000 defence personnel will be involved in the exercise comprising of Australian Naval, Army and Air force and their assets. Dipa Karmakar has made it to the Vault Finals after finishing third in the qualifying round of the Artistic Gymnastics World Cup at Baku in Azerbaijan. Hours before the Mumbai Cricket Association (MCA) ad-hoc committee was to discuss the fate of the senior selection panel, all four members of the selection committee have submitted their resignation.